Hundreds of hate terrorists are on the loose in France, warns a French minister. Jewish leader: Radical Islam akin to Nazism. The French Interior Minister warned that “dozens, even hundreds of individuals who are capable of organizing themselves” into groups similar to a radical Muslim cell whose leader was killed in a police raid on Saturday. Following the warning, Richard Prasquier, the head of the CRIF that represents most French Jews, said Monday that Islamic radicalism was akin to Nazism and warned that society had not yet realized "the scale of the evil" it faces. Interior Minister Manuel Valls’ warned of terrorists at large after a crackdown that sent shockwaves through the country's Jewish community, according to AFP. The nationwide sweep left one man dead and 12 others in detention on suspicion of either being involved in the bombing of a Jewish grocery last month or of planning other anti-Semitic attacks. The LeMonde newspaper wrote in a front-page editorial, "French Islam is not lacking in major voices to fight anti-Jewish racism. They do it regularly, almost ritually. But the whole country needs to become aware of the problem. This issue concerns us all." Police on Saturday shot dead the suspected leader of the group, Jeremie Louis-Sidney, 33, after he opened fire on officers seeking to arrest him in a dawn raid at his home in Strasbourg, eastern France. Police said traces of Louis-Sidney's DNA had been found on the pin of a grenade thrown into a kosher grocery in the Paris suburbs on September 19. Subsequent police raids on addresses in the Paris region and in the Riviera resort of Cannes resulted in 12 suspects being detained and a total of 27,000 Euros ($35,000) in cash being seized along with arms, radical Islamic literature, computer files and a list of Jewish organizations. 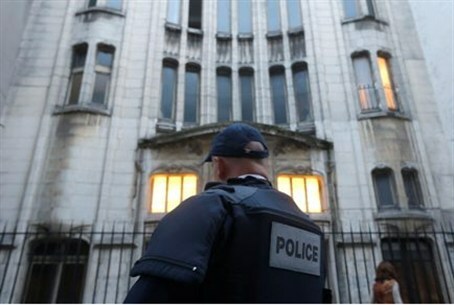 The raids sparked alarm within the Jewish community, which has registered a steady rise in the number of anti-Semitic incidents, both before and since Islamist Mohammed Merah's March killing of Rabbi Jonathan Sandler, his two children and one of their schoolmates in Toulouse in March. Merah also killed three French paratroopers before dying himself in a police siege. It has since become clear that he had been on the radar of France's internal security services for years and that authorities fatally under-estimated the extent of his radicalisation following trips to Afghanistan and Pakistan and the threat he posed as a result. French President Francois Hollande has ordered tightened security around synagogues and other possible targets in the wake of the weekend's developments. For an analysis of the French government's role in giving in to Islam by journalist Giulio Meotti, click here.